Deep underground at the Horne Lake Caves on Vancouver Island, an unexpected connection between father and son. “THE MAYANS believed that caves were the gateway to the underworld,” says my bearded and amicable guide as he leads me deeper into the forest. Dave “from the Cave” (as he likes to say), is wearing dirt-stained coveralls and a hard hat, the appropriate attire for someone who enjoys spending countless hours deep inside the blackness of the earth. Dave arches an eyebrow and pauses for dramatic effect. I scan the forest, thick and dripping here in Horne Lake Caves Provincial Park. First opened in 1971, the park was formed to protect the karst (eroded limestone landscape) features and caves cut into the relatively soft rock beneath our feet. The caves were formed from the continuous flow of water seeping in through the cracks, shaping and carving for tens of thousands of years. The familiar stalagmites and stalagtites that define this underground realm are formed by dissolved calcite, built drip by drip. We continue on the trail until reaching an opening in the earth. A shaft of sunlight breaks through the trees, revealing the mysterious entrance to the park’s star attraction. Dave lowers himself down, using all limbs for support, strongly resembling Gollum, the cave-dweller from Lord of the Rings. 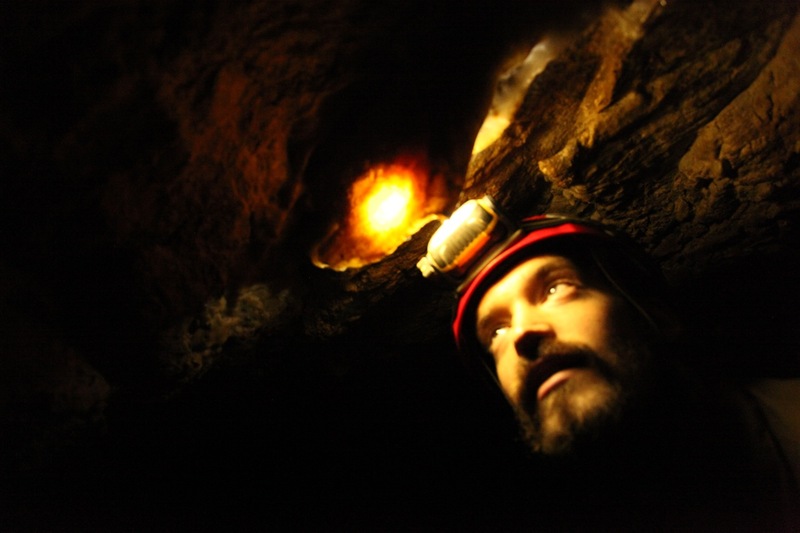 “He was the ultimate caver,” Dave responds when I mention the similarity. As I step down to the gate that blocks the ladder into the depths, I utter a quick prayer for the battery life of the only “Precious” down in the dark: my headlamp. Dave retrieves a set of keys from his overalls and unlocks the gate. It swings open with the satisfying squeal, and he motions me to cross the threshold. I’m swept forward by tendrils of air that glide along my exposed skin, as if I’m stepping into a lung of the earth. There’s clatter behind me as Dave locks the gate behind us. He explains it’s just a precaution, to keep unguided visitors from following behind. Somehow, it still makes me a little nervous. Dave illuminates the rock with this headlamp. AS THE THEME music plays in my head, Dave explains how this area of every cave got its name because it’s the last place light can reach before heading deeper into the depths. “How do you know so much about caves?” I ask. “My dad,” Dave replies. “He loves caves. I grew up exploring with him in Pennsylvania.” There’s a touch of nostalgia in his voice, as he reflects fondly on the memories. I wonder if perhaps a disagreement had come between them and if they’d grown apart over the years. WE PLUNGE DEEPER into Riverbend Cave, our headlamps illuminating the path–over rolling shelves of rock, plodding through mysterious streams, shimmying into thin crevices only to open to echoing rooms. “All of these caves were carved by thousands of years of water melting and draining into these cracks, slowly wearing down the limestone. This shows you the power of water.” Dave speaks with clear awe of the unfathomable geological forces at play. I see it easily: the mound now resembles an upside-down Buddha, serene and chubby. His features are worn smooth, but I can still determine the smiling face. After a moment of respect, we bow our heads, and continue onward. AT THE MOTION OF Dave’s hand, we stop. “Here is good.” He reaches up and flicks off his headlamp. I do the same, and we’re quickly plunged into complete and utter darkness. In the distance, I can hear the echoes of a distance stream. The edges of the cave, which were discernible moments before, are now spatially impossible to sense. I listen to my own heartbeat. I imagine my life, abandoned in this blackness, unable to navigate the treacherous path back to the entrance. A sense of loneliness creeps into my bones. I wonder how anyone could stand a life in the caves, let alone make it their occupation. Here there were no creatures, no semblance of sentient life of any kind. Just cold, dank, bleakness, stretching to the core of the earth. “Why do you do it?” I ask Dave. I can’t see his face, but I picture him mulling the question. I gaze around in the blackness, and for a moment, I sense what he means. A white flash and suddenly Dave appears with his headlamp shining, a grin on his face. Thanks to Horne Lake Caves for the experience. If caving isn’t your cup of tea, you can also try a kayak trip with Adventuress Wilderness Adventures. After a day outdoors, bonus points for relaxing at the Grotto Mineral Spa (thanks to Tigh Na Mara Resort for hosting me).